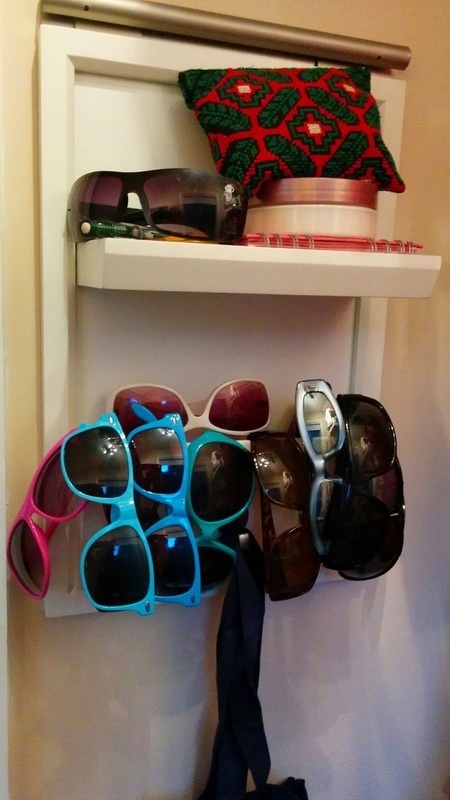 For some reason, I have a lot of sunglasses. Actually, I know quite well why: I'm a fair-haired, blue-eyed human who's lived most of her life at high altitudes or in very sunny places, or both. Skin & eye cancer are both worries, so I always wear sunglasses. However, I never pay more than $8-10/pair (honest, guv! ), and sometimes even less (i.e., free Bike To Work Day specs!). But where to keep them has always been a problem. At various times they've lived on top of shelves, in a small table by the front door, or in a cardboard box in a shoe cabinet. I have scoured the web & Etsy, looking for one great idea, and typically only found something that stored 2-3 pairs (haha!). My last try at organization was this hanging shelf/hook/bin combo, no longer available at Crate & Barrel, which is pretty great and worked okay. Except trying to get one pair out usually meant 2-3 other pairs fell out; not the best way to have a smooth entry at 6:45 a.m. And there are hooks underneath those specs, which go to waste. Plus everything was unstable, so the slightest flounce of a raincoat or scarf often meant a cascade of glasses, scaring the cat & irritating the Roommate. Which brings me to the Roommate. He rarely makes any type of negative comment about something I'm doing (I really have to be doing something bad or ridiculous), so when he became quite irritated last week & said, "Well, it wouldn't be such a problem if you didn't have so many. And we can't even use the hooks!" Which is a reasonable comment. 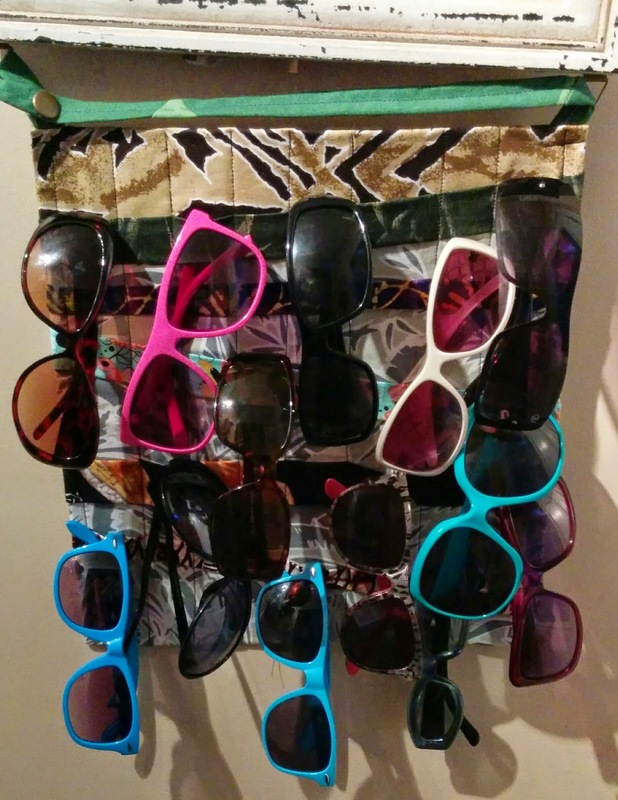 So I got to thinking about what I could make that would fit all my sunglasses, but not take up too much space and would work with the hooks on the bottom of a mirror we already have there. I had some heavy duty interfacing (possibly for a smocking idea), so decided to use that, plus scraps. At first I was thinking I'd make narrow pockets. But I ran that idea by a coworker who suggested grosgrain ribbon sewed at varying widths and angles. I don't have any grosgrain, so decided instead to make strips, also out of scraps. I'm so glad I got her opinion (thanks!). You can see it here, on the left. I made a little strap with a snap to go through the triangle-shaped hangers that were on the mirror when we bought it (I've never figured out what they could be for), so it didn't make a new hole in the wall. It's not super pretty, but I just wanted to use up stuff, so wasn't worrying too much about matching. I also suspected (and I was correct) that once I got all the sunglasses on it, the mismatched fabrics wouldn't show. As you can see, it's got plenty of work to do! When I showed the Roommate, he was super impressed (he always is--enthusiasm honed from years of being an elementary teacher). 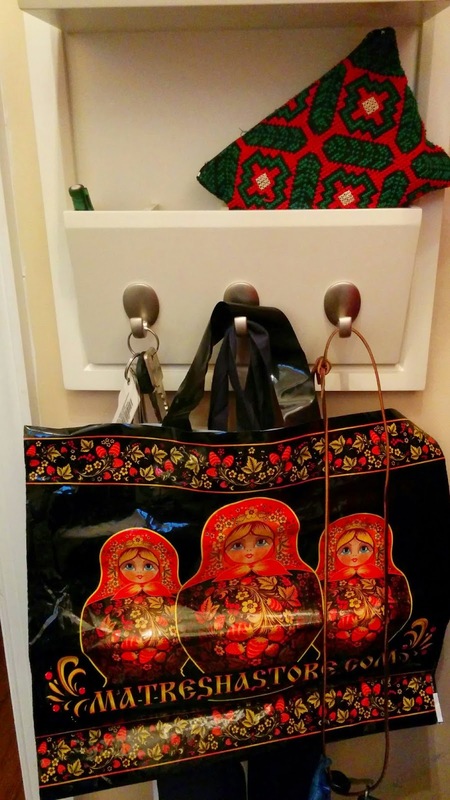 Now they are easy to find, easy to take out and put away & there's plenty of room for more! 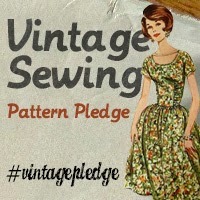 Apologies for not having anything to show in the way of sewing; I'm hoping to do some finishing this weekend. 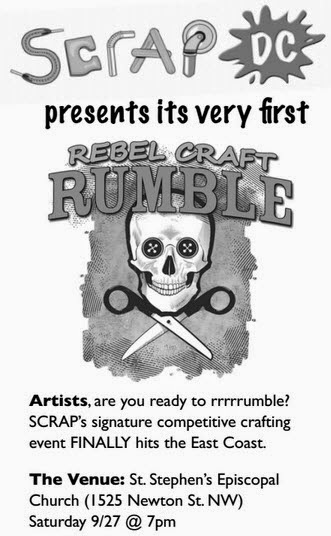 In the meantime, I wanted to let you know about ScrapDC's Rebel Craft Rumble, which is this Saturday evening, 9/27/14, in DC's hoppin' Columbia Heights! 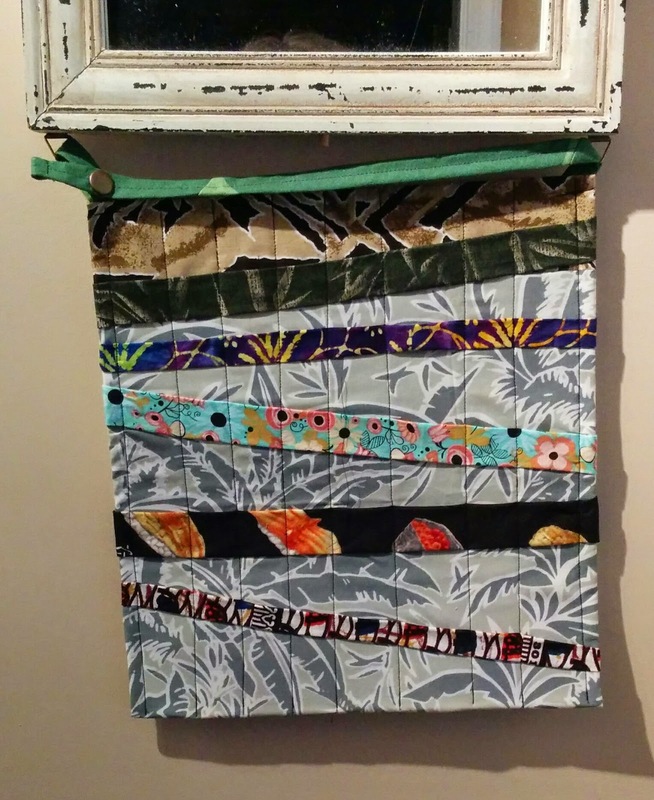 If you've ever wondered what Project Runway would look like when crossed with Iron Chef, here's your chance to help out plus support ScrapDC, a non-profit which inspires environmentally sustainable creative re-use!